Family law attorney Marlene Pontrelli knows the road you’re traveling. After more than thirty years of practicing law and guiding hundreds of individuals through the ritual of divorce, she understands not only the legal aspects of divorce, but also the emotional weight that must be lifted before a person can move forward. 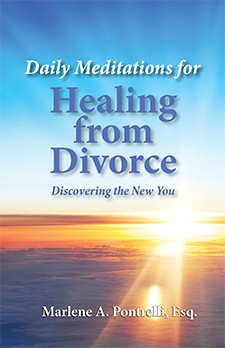 In Daily Meditations for Healing from Divorce, Pontrelli addresses this personal, emotional side of ending a marriage, offering meditations filled with inspiring, uplifting advice that will comfort and guide you toward acceptance of a new beginning filled with opportunities.